A high-profile case in point began in 2017, when a Tennessee resident filed a quitclaim deed transferring the interest in an acre of rural land to the Trump Organization. After the conveyance became news, the Trump Organization filed a petition to void the quitclaim, stating that the organization did not know about, let alone participate in, the deed transfer, execution, or recordation. In January 2019, Third Judicial District Chancellor Doug Jenkins voided the troublesome deed. Checklist: Spot the Issues Before Accepting a Deed. It is not uncommon for a nonprofit organization to receive an offer of land. But the organization should look for any potential drawbacks before accepting a donation of real property. It is often best to refuse a deed if due diligence reveals that the land will create significant burdens. The donor (grantor) holds title to the property, as affirmed by the recorded deed, title policy, and property tax records. No other co-owners or parties need to consent to the conveyance. The donor intends to transfer the entire interest in the property. No encumbrances exist on the property. Taxes, insurance, utility bills, and any fees or dues are paid up. There is no mortgage, land contract, or mechanic’s lien. Optimally, the deed is a general warranty deed rather than a quitclaim deed, so that the grantor is warranting good title, free from clouds that would make the property difficult to sell in the future. 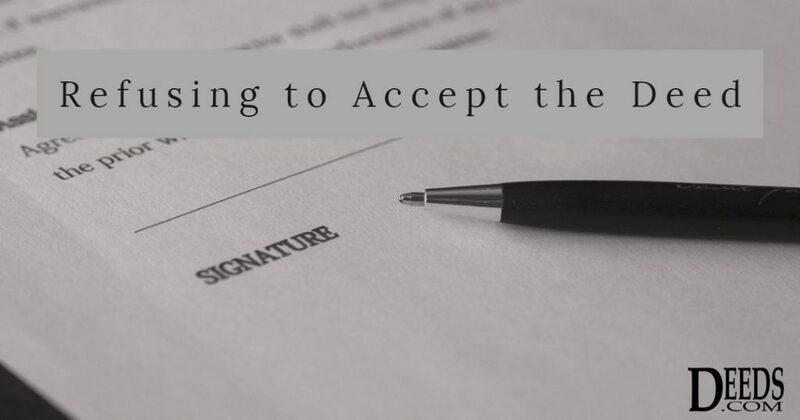 Alternatively, the donor should participate in the drafting of a gift agreement, including an agreement to indemnify the recipient organization if an unknown encumbrance or defect surfaces in the future. Weigh the Costs and Benefits Before Accepting a Deed. The grantee organization must become the new beneficiary of any title insurance policy. Title insurance is necessary—especially in cases where only a quitclaim deed is given. â€‹If the donor wishes to cover insurance or other costs related to the property, the legal gift agreement should explain the terms of payment. Be sure, too, that the property is both professionally inspected and appraised. High-value real estate that will perform well on the market may justify the expenses involved in accepting the deed. In addition to monetary value, the organization should ensure that the property and its surroundings are conducive to uses the grantee could make of it, even if the only intention is land preservation. Examine the likely maintenance costs for the property. Any outstanding contracts, agreements, or offers to buy or sell the property must have acceptable, sustainable terms. To Prevent Liability, an Organization Might Decide Not to Take the Deed Directly. The organization accepts the deed as a direct gift. The organization forms a sole-member limited liability company (LLC) to accept and hold the property. This is especially prudent if the property could contain environmental or other liabilities. The Internal Revenue Service deems a charitable contribution to an LLC wholly owned by a charity tax-deductible—to the same extent as a contribution made directly to its sole member, the charity. Yet some states may deem the LLC ineligible for property tax exemptions. Check state and local tax provisions. To understand all cost, income, and tax ramifications, the recipient should consult with its accountant, and seek a tax attorney’s advice. Your due diligence should include an Environmental Site Assessment (ESA) to evaluate the environmental liability of the property. Seek advice from a qualified environmental specialist to select the proper assessment for either residential or industrial real estate. Environmental due diligence is normally a buyer’s responsibility. Yet in the case of a gift to an organization, the donor (grantor) may be reasonably expected to conduct it. This enables the donor to make appropriate representations and warranties, to avoid conveying heavy burdens and liabilities, and to correctly assess the value of the donation. Use a written disclaimer if you receive an unwanted deed. Follow federal tax disclaimer laws for deadlines. Select your state to view the Disclaimer of Interest (such as this page for an Ohio disclaimer). Execute a copy to submit to the recorder of deeds in the same county as the property. Note that the Ohio provision we link here matches Internal Revenue Code Section 2518, which requires you to submit the disclaimer within 9 months of the property conveyance. Forms on Deeds.com are always easy to download and complete, and continually updated. Contact us with questions, keeping in mind that legal advice must come from your own lawyer, based on an examination of your case-specific facts and needs. Previous PostPrevious What is the Chain of Title in Real Estate?